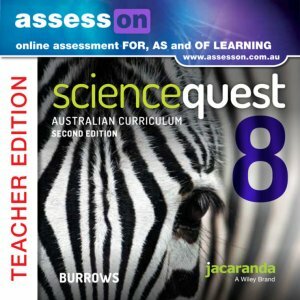 assessON Science Quest 8 for the Australian Curriculum 2E Teacher Edition (Online Purchase) is an innovative online tool that provides additional assessment resources and enables online assessments and automatic feedback. • Assesses and track students’ readiness FOR learning, their progress AS they learn and their levels OF achievement. • Create and assign formal and informal online assessments. • Access online NAPLAN practice tests. • Schedule homework and assessment tasks that are automatically marked and recorded. • Track assigned work completed by students against scheduled deadlines. • View and compare student answers. • Track the progress and performance of students at the individual, group or whole class level against national curriculum requirements. • Identify individual student strengths and weaknesses.